This dish contains a lot of my favourite summertime ingredients. I was brought up on summertime barbecues but now I live in a first floor flat barbecues at pretty much off the menu. However grilling remains one of my favourite ways to cook a quick summertime meal, especially with my favourite kitchen gadget which is my freestanding grill. In the summer I find I repeat this kind of dish over and over again. Work days are long, evenings are hot and I don’t want to spend loads of time in a hot kitchen. Marinating some chicken, cooking it quickly on the grill and dishing it up with some tasty warm salad ingredients are my summer evening solution. You may read my recipe below, and think ‘Hang on a minute, but you’ve spent an hour roasting beetroot? What are you on about a quick meal?’, but this is the sort of thing I do a batch of at the weekend when there’s not a lot else going on so that I can have it handy in the fridge to throw into meals throughout the week. Alternatively, buy the ready cooked stuff, even quicker. Don’t worry if you don’t have a counter-top grill like mine, a griddle pan is a great alternative or a large frying pan will do the trick, you just won’t get those lovely golden grill marks. 1. Roast the whole beetroot in the oven at 200° for 45 minutes. When cooked, allow to cool, peel and cut into wedges. 2. Dice the chicken into bite size pieces. 3. Mix together the ingredients for the marinade and thoroughly coat the chicken pieces. If you have time, cover and leave in the fridge for 30 minutes or overnight if you’re planning ahead. Cooking it straight away is fine but if you can leave it in the fridge over night it will really allow the flavours to develop. 4. Cook the quinoa according to packet instructions. 5. Heat a small knob of butter in a large pan and gently wilt the spinach until softened. 6. Meanwhile on a hot grill or in a hot pan cook the halloumi until golden grill marks appear on each side. 7. Cook the chicken on a grill or in a hot pan for 10-15 minutes or until cooked through. 8. 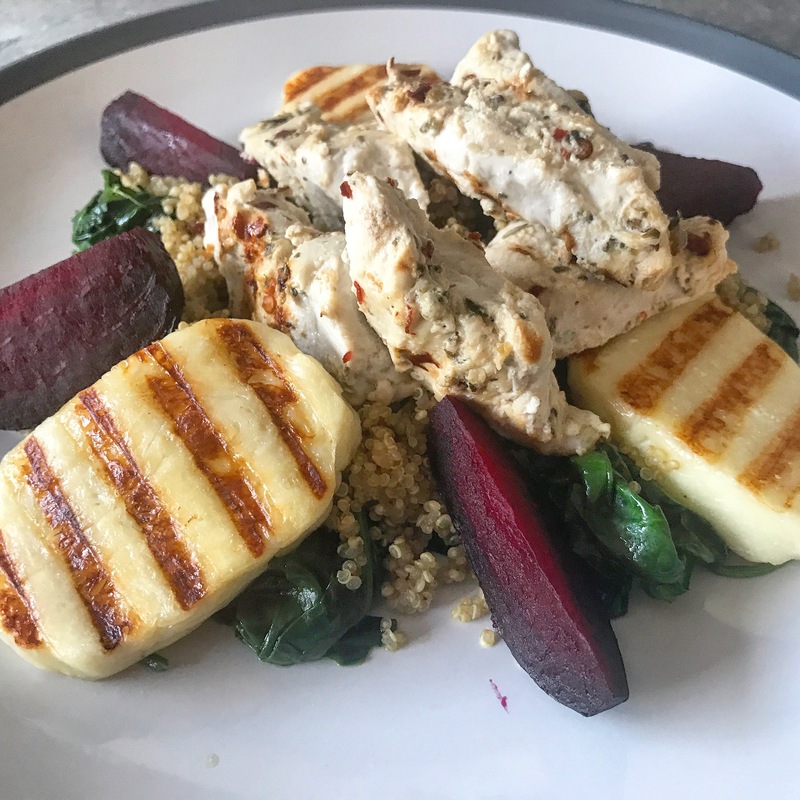 Plate up the cooked spinach and quinoa, arrange the beetroot wedges around the plate and top with the cooked chicken.